Thank you Total Tea for sponsoring this post. All opinions remain my own. Thank you for supporting the brands that support Beautifully Candid. One of the best things I can do for myself is find a few extra minutes to unwind and really be able to relax. If I'm being honest, those rare moments don't happen as much as I'd like them to. I'm trying my best to change that because I see a big difference in myself when I can truly shut things out and allow myself to relax. Now, if only I could get that laundry to fold itself and my kids to actually pick their things up—imagine how many more relaxing moments I could let myself have. 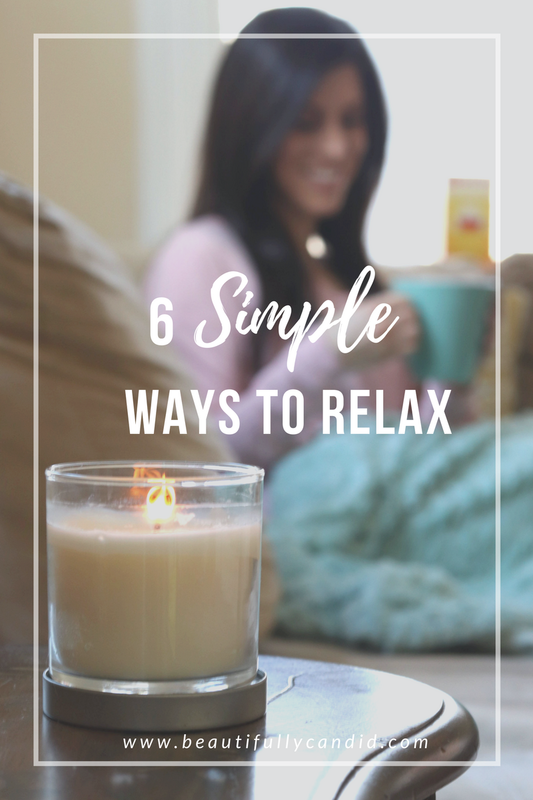 Over the past few weeks I really thought about what helps me to relax and how I can incorporate simple ways into my weekly routine. Even if I'm not able to do all of them at the same time (it's a beautiful thing when I do), doing at least one of them helps me to unwind. 1. ENJOY A CUP OF TEA: since I'm not a coffee drinker (there I said it! ), tea has always been my go-to. One of the things I look forward to on the weekends is enjoying a cup with my breakfast. During the week I also enjoy a cup after the boys go to bed. Let's face it, when they're awake it's not necessarily the most relaxing environment. Boy do I love those tiny humans though. 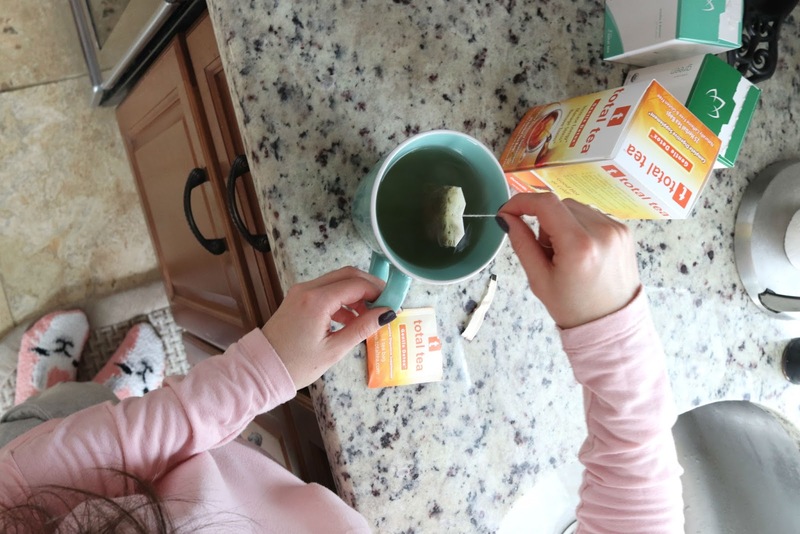 Since tea is such a big part of my routine, I don't drink just any. I really enjoy Total Tea and love the different options and flavors they have. Not only are they a family owned business, but they believe a healthy life is a happy life. 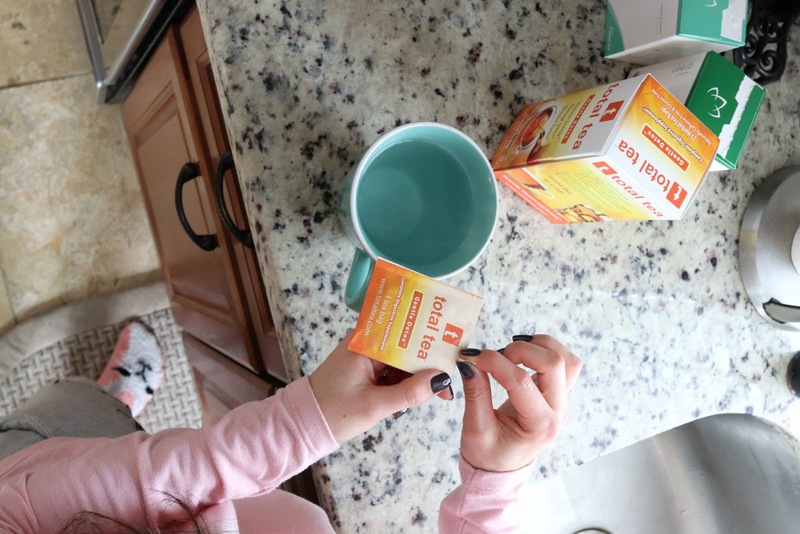 Their detox tea has been one of my favorites, and I also love the organic options they have. I've always been a big green tea drinker but their peppermint tea and chamomile tea have also been two that I am loving. I can honestly say enjoying a cup of tea is probably the most consistent thing I do for myself to help relax. 2. LIGHT A SCENTED CANDLE: candles are a great way to add to a relaxing environment. I'm a little picky when it comes to my candle scents. I try to stay away from a lot of floral scents because I've actually been around some candles that will make me sneeze. Those seasonal allergies are rough for me and not something I'm looking forward to. When I do find scents that I love, sitting down with my cup of a tea and a lit candle helps to melt the stress away (pun intended, haha). 3. COZY BLANKET: I don't know what it is, but I could seriously curl up with a blanket regardless of the season. The fluffier and the softer the better. I'm not sure I could ever have too many throw blankets, because I seriously want them all. If I'm sitting on the couch there is always one next to me. 4. COMFORTABLE CLOTHES: one of the first things I do when I get home from work is change out of my work clothes. I feel a lot more relaxed in clothes that are suitable for lounging around. 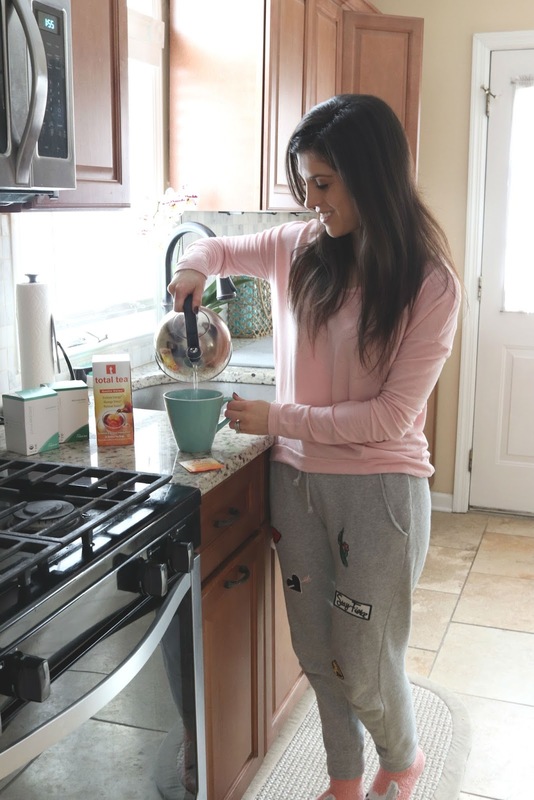 This usually consists of some sort of workout wear (yoga pants are life), a relaxed tee or over sized sweatshirt, oh, and I can't forget about cozy socks! I live in my cozy socks in the winter. 5. READING A BOOK: this is something I am really working hard on incorporating back into my routine. Before I had the boys I used to read a lot more than I do now. I really miss it, and have been making it a point to try and do a little each week. Those days of finishing a book in a few weeks are probably long gone, or at least until my boys don't demand as much of my attention or I can work on saying no to taking on too much. My goal for now is to get through a few chapters here and there, which is something I know is doable. I always end up feeling so relax after I get some reading in and also fall asleep so easily if I read before bed. 6. MUSIC: a lot of what I've mentioned here are mainly things I do after the boys go to bed. However, listening to music is something I've been able to do throughout different parts of my day. I like to try and start my day off on a positive note and the elevation worship station on Pandora is perfect for that. Even if I'm listening while in the shower or doing my makeup, it always puts me in a better mood. Some good tunes also help to make the mornings a little less stressful, which is always a wonderful thing. And who doesn't love a quick dance party to get things going? When I have a moment to sit down with a cup of tea, light my candle, curl up in a blanket in my lounge clothes all while reading a book, and listening to music, well that my friends, is my kind of relaxing.